We pause a moment for reflection herein, to give sincere and hearty thanks to our Armed Forces and to that ‘greatest generation’ having sacrificed so very much to ensure the rights and freedoms we continue to enjoy have remained a steadfast part of the American fabric of life. The military might of any great nation cannot be overstated. Nor should it ever be set aside or merely taken for granted. It is a privilege to live in a country where the individual supersedes the homogenized collective whole; where, liberty – in all its many divinely-lit facets (and perhaps a few cringe-worthy) is allowed to flourish without reprisals and where the strength of national pride and character is built upon and by individuals collectively pooling their talents and resources to achieve great things, still best exemplified via the term, ‘e pluribus unum’ (translated, ‘out of many – one’). WWII and its historic fallout has given film makers ever since a wellspring of gripping narratives; the tales, slowly shifting from romanticized depictions to the horrific realities many faced with unflinching resolve, dare we suggest, gallantry and resistance against tyranny - a very noble cause. And while it may sound as though I am rhapsodizing quixotic from my own limited (and non-serving) comprehension, in my own defense, I will simply extend both humility and thanks to those who stand silent and tall in the face of danger; to the many for whom my protection, and indeed, the defense of millions at home and abroad is more a devotion than an oath and a loyalty blindly pledged to the nameless millions they will never meet in person but have chosen to safeguard with the same valor they would apply in defense on their own families. As much then as I am able, I respectfully honor and treasure the fighting men and women of the Armed Forces. They are unquestionably among the finest examples of humanity on this earth. 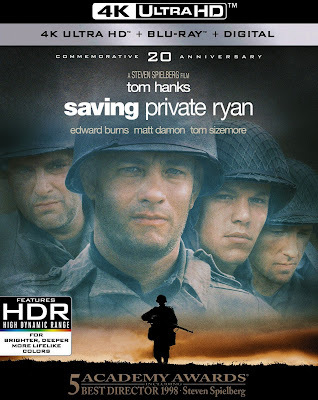 Given the extended life of the war drama on the movie screen, it is saying a great deal perhaps only a handful can complete with Steven Spielberg's Saving Private Ryan (1998); a $481 million-dollar box office dynamo, brilliantly scripted - if gruesomely recalled by writer, Robert Rodat, who effortlessly shifts the picture’s focus from the brutalities of mechanized combat to the resultant human sacrifice. There are moments in Saving Private Ryan indelibly etched in the heart, likely to scar the subconscious in seared snapshots ripped from the war-correspondent’s memoirs or yellowing pages of a LIFE magazine: the staggering loss felt by Mrs. Ryan (Kathleen Byron) upon receiving consecutive telegrams informing the death of three of her four sons; or the moment when an aged James Francis Ryan (Harrison Young) is stricken to his core in recalling the gallantry of fallen comrades, or, the hellish charge in Ramelle that brought him safely home so many years earlier (to name but three vignettes), the latter, memorably stirred by John William’s ‘lump in the throat’ inducing underscore; his cue – ‘Hymn to the Fallen’ – an exemplar of what film scoring ought to be. Many confuse the impetus for Rodat's inspiration as direct homage to the fallen Niland brothers. But actually, Rodat conceived his story after learning of the remarkably similar fate of four brothers who died during the American Civil War. He submitted his first draft to producer, Mark Gordon, later to find its way into the hands of star, Tom Hanks, who then gave it to Spielberg. Having demonstrated his passion for the period with Schindler's List (1994), Spielberg immediately signed on to helm Saving Private Ryan. Spielberg’s singular ambition was to cast the movie from a myriad of faces uncannily resembling those forever immortalized in vintage newsreel footage. “You know, the people in World War II actually looked different than people look today…so I wanted to match the faces I saw on the newsreels.” Once casting choices had been made, Spielberg determined they should ‘look the part’. To this end, Spielberg had all his co-stars (except Matt Damon) Edward Burns, Barry Pepper, Vin Diesel, Adam Goldberg, Giovanni Ribisi, and Tom Hanks put through the rigors of a ten day ‘boot camp’ overseen by Marine veteran, Dale Dye and Warriors, Inc., a California-based company specializing in training actors for realistic military maneuvers. This preparation would decidedly come in handy as Spielberg launched into his bloody recreation of the Allied invasion of Normandy – arguably, the most hellish depiction likely ever recorded of that frequently documented cacophony of human carnage. For twenty odd minutes, the audience is plunged into the grotesqueness and irony of sheer waste as these conflicting factions come to their death grips on Omaha Beach. Janusz Kamiński’s desaturated cinematography, born of a khaki/grey and steely blue dawn color palette, assaults the eye with the orangey/red splatter of decimated human remains, casually littering these windswept shores. Spielberg bravely allows this unremitting display to fully sink into the public consciousness. Once witnessed, it continues to haunt the memory with the magnification of that oft cliched, though nevertheless, very sobering declaration; that lest we forget - war, is the human (or perhaps ‘inhumane’) equivalent of hell. Interestingly, Spielberg had initial misgivings about making Saving Private Ryan, although he clearly harbored an affinity for the period as illustrated by previous successes with Empire of the Sun (1987) and Schindler’s List (1993). In hindsight, the double-whammy of critical/commercial success afforded Saving Private Ryan encouraged Spielberg to serve as executive producer on the HBO mini-series, Band of Brothers (2001), its counterpart, The Pacific (2010, reunited with Tom Hanks), and finally, to explore WWI with the as affecting War Horse (2011). Saving Private Ryan is book-ended by a superb prologue set in the present, authentically at Normandy’s American Cemetery and Memorial in Colleville-sur-Mer and Calvados. From here, the production bounced around, to Hatfield, Hertfordshire, Thames Park, Oxfordshire and Wiltshire, England, with the invasion of Normandy actually lensed on Ballinesker Beach, Curracloe Strand, Ballinesker, just east of Curracloe, County Wexford, Ireland. Spielberg, populated this latter sequence with a staggering, 1,500 extras culled from Irish Reserves, members of local reenactment groups, and real-life amputees, at an impressive cost of $12 million. A stickler for detail, Spielberg also insisted the depiction of Charlie Company be as authentic to the historical record as possible, with only slight modifications made for ‘artistic reasons’; from the sea sickness experienced by many before they reached the beaches, and the distinct ‘ping’ of M1 Garand rifles ejecting their ammunition clips, right down to the original code names used. Twelve genuine 10 LCVPs and 2 LCMs were employed as part of the armada of landing craft to ‘invade’ the beach; Spielberg, employing underwater cameras to depict soldiers being hit by bullets beneath the waves. As no functioning Tiger I German armored vehicles existed, copies were built on Soviet T-34 chasses, with similar modifications made to depict Panzers and Marder III tank destroyers. The actual ‘look’ of this footage, however, was a collaborative effort from Spielberg and his cinematographer, Janusz Kamiński; the latter, stripping off the protective coating from the camera lens to create a more contrasty and diffused focus. Later, the camera negative was run through a process known as ‘bleach bypass’ to offset brightness and desaturate its color. Saving Private Ryan opens in the present, at the Normandy American Cemetery and Memorial. Aged war veteran, James Francis Ryan makes his pilgrimage to one of the countless markers dotting this silent and sunny landscape, becoming genuinely overwrought with emotion. As his family aid in his comfort, our story regresses in flashback to June 6, 1944: America’s landing on Omaha Beach as part of the Normandy Invasion. Casualties are staggering as the German defensive artillery unleashes its full might. Amidst the chaos and confusion, a valiant Captain John H. Miller (Tom Hanks) of the 2nd Ranger Battalion assembles his troop, burrowing deep into the German defenses. Spielberg pauses a moment on the knapsack of a dead soldier lying face-down in the blood-stained surf, stenciled with the name, Ryan, S. In Washington, General George Marshall (Harve Presnell) discovers three of the four Ryan brothers have been killed in action; the fourth, James (Matt Damon) presumably MIA after having parachuted somewhere over Normandy. 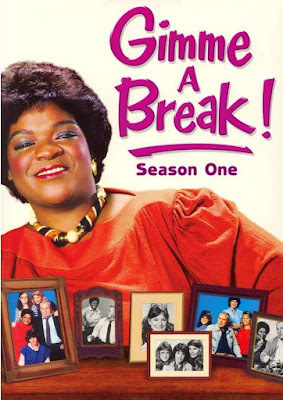 Realizing, the boys’ mother will receive three telegrams from the War Department, Marshall fires off an executive memo to bring Private James Ryan home immediately. Still beleaguered and exhausted from three days fighting after D-Day, Miller is given his directive to locate Private Ryan. Expediently, Miller assembles a crackerjack team for the task, including Sergeant Mike Horvath (Tom Sizemore), Privates First Class Richard Reiben (Edward Burns) and Adrian Caparzo (Vin Diesel), Privates Stanley Mellish (Adam Goldberg) and Danny Jackson (Barry Pepper), medic Irwin Wade (Giovanni Ribisi), Corporal Timothy Upham (Jeremy Davies), plus a cartographer and interpreter borrowed from another unit. The troop moves out. But it is not long before the war inflicts its first casualty. Caparzo takes a sniper’s bullet at Neuville; the enemy dispatched immediately thereafter by Jackson. Coming upon a friend of James Ryan, Miller moves his company toward Ramelle, where it is assumed Ryan is part of a team defending an important bridge. Alas, en route to the town Miller elects to neutralize a Nazi machine gun position, despite strenuous objections from the rest of his men. Still, Miller is in charge. And thus, the ambush occurs. Wade is killed by a Nazi soldier the company crudely nicknamed, Steamboat Willie (Joerg Stadler). But Miller shows ‘Willie’ mercy, provided he surrenders to the first Allied Unit he encounters. Disgusted by this turn of events, Reiben makes his intention to desert known, prompting a confrontation with Horvath that Miller quells by revealing to all his knowledge the men have set up a betting pool. Very reluctantly, Reiben remains with the troop. Just outside of Ramelle, Miller and his men encounter another German half-track. They ambush this modest stronghold together with three paratroopers (Neil Finnighan, Peter Miles), the latter of whom it is discovered is none other than the man they have come to seek out: Private James Ryan (Matt Damon). Following a successful surprise attack, Miller pulls Ryan aside and explains to him the purpose of his mission. He also, reveals the loss of his brothers and the two men from his company who never made it to Ramelle. Considering the situation frankly, Ryan informs Miller he intends to remain at the front, not only to honor his fallen siblings, but to fight at the side of ‘the only brothers’ he now has left in this world – his fellow soldiers. Miller is humbled by Ryan’s valor and plans to aid these paratroopers in their takeover of the bridge against a pending Nazi onslaught. Rigging the already brutalized town with mines, Molotov cocktails, detonation cords and ‘sticky bombs’ made from socks filled with Composition B smeared with thick grease, Miller and his men hunker down for a protracted assault. A faction of the 2nd SS Panzer Division bears down hard on Ramelle. Despite inflicting heavy casualties on the enemy, most of the paratroopers, along with Jackson, Mellish and Horvath are killed. Crippled by anxiety, Upham conceals himself from the foe. In attempting to blow up the bridge, Miller is mortally wounded by Steamboat Willie. Now, a dying Miller begrudgingly crawls to the middle of the bridge, opening fire on the advancing Nazi troops. At the last possible moment, when all appears lost, an American P-51 Mustang flies overhead, accompanied by American armored units on the ground. The Nazi stronghold is put on the run. Regaining his composure, Upham emerges from his hiding spot and confronts Willie. Believing he will be spared a second time, the Nazi grins and raises his defenseless hands. But Upham is not Miller. He shoots Willie dead to avenge Miller but allows the remaining enemy soldiers their retreat. Reiben and Ryan comfort Miller in his dying moments, Miller cryptically suggesting Ryan has earned his release from service. We return to the present with these words still echoing in Ryan’s ears; the old man kneeling at Miller’s headstone. Comforted by his wife and family, Ryan fears he has lived a life unworthy of their sacrifices. Mrs. Ryan assures her husband that he is, and has always been, an honorable man. Ryan rises to his feet and proudly salutes his fallen comrades. It has taken me longer to review Paramount’s 4K release of Saving Private Ryan for the simple reason I have always found the picture an exceptionally difficult emotional experience. I do not mind admitting I sincerely wept in the theater when I first saw it in 1998 and have only been able to get through my standard Blu-ray disc twice since in a single night’s viewing. What can I tell you? It’s that kind of a picture for me. I have now exposed myself to Spielberg’s hauntingly passionate roller coaster ride yet again, this time in the stunning clarity of UHD 4K. Truthfully, I do not think I shall find any good reason to ever revisit this movie again. It hits a little too close to home for me. That said, Saving Private Ryan is precisely the sort of movie that should be required viewing for every living adult on this planet; Spielberg’s disturbingly graphic and emotive maelstrom, an affecting reminder of the oft clichéd adage about “freedom not being free.” Indeed, freedom has been, and continues to be, paid on an almost hourly basis with the sweat, blood and valor of individuals devoted to liberty around the world. I will stop just short of labeling Saving Private Ryan Steven Spielberg’s finest hour. Undeniably, a master craftsman and visionary storyteller of Spielberg’s ilk and body of work has far too many contenders to effectively choose only one for this hallowed top spot with any degree of certainty. Without question, however, Miller is Tom Hanks greatest achievement (perhaps, tied only by his sensitive turn as Forrest Gump), with a nod paid to the other stellar performance from Matt Damon that is almost as good. My one regret herein is Spielberg chose to stage a good many of the combat sequences with the frenetic energy of a handheld camera. I understand exactly why he did it; the equilibrium-discombobulating tug and bounce of the camera effectively typifying the exhaustive and chaotic nature of war. There is nothing clean or artful about human carnage or the mind-numbing wreckage it leaves behind. And Spielberg's meticulous skill has spared the picture from becoming just one extended, vomit-inducing blood fest. The point herein is the audience, unlike the solider, need brief respites to realign their perspectives. Spielberg, alas, never quite gives us the opportunity to appreciate the thought-numbing sobriety of mano a mano self-destruction. In an effort to make the experience more genuinely immersive, Spielberg has distilled the humanity of the piece into a much bleaker reenactment, where the specter for death unravels, at least partly, the real human saga at the crux of his storytelling. In the final analysis, Saving Private Ryan is affectingly powerful. But it remains, at least for this reviewer, a movie that cannot be ‘enjoyed’ purely as an entertainment. I can admire Spielberg’s artistry as a testament to the fallen – yes. And again, deservedly rife for rediscovery by each new generation. But once seen, it is best remembered from memory than repeat viewings. The horrors of war as depicted herein are disturbing enough. Viewing Saving Private Ryan in 4K, properly color graded with HDR and Dolby Vision is a deliberately grainy experience. Spielberg and his cinematographer, Janusz Kaminski have conspired to create a frayed-around-the-edges newsreel quality that is perfectly realized in UHD. The quantum difference between 4K and Blu-ray is in the details, every pebble and grain of sand on display, the overall clarity adding yet another layer to our appreciation for what the 4K format can achieve when time, care and money are afforded a home video release. Overall image brightness is definitely improved. The gritty visuals are exaggerated, almost to brink of appearing digitally harsh. Nothing can quite prepare you for the experience of this hyper-sensitive visual display: a lot of grime, sweat and blood-spattered pores, wrinkles and the like, amplified to a level never before achieved. 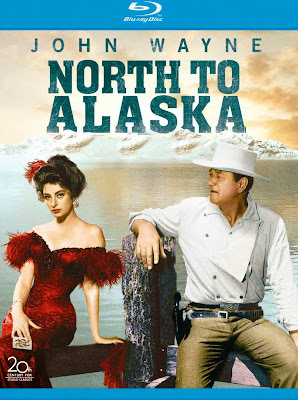 Directly compared against the standard Blu-ray, it is the razor-sharpness and sporadic pop of color on the 4K counterpart that really antes up the experience of revisiting this movie on home video. Saving Private Ryan’s original 5.1 DTS has been reinvented as an even more immersive Dolby Atmos mix. And although the stage-dominant effects greatly benefit from this upgrade, it is the authentic clarity of virtually every subtly nuanced SFX, dialogue and music cue that distinguishes this re-imagining as yet another exemplar for the way modern movies, properly remastered for home video, ought to sound – as well as look. The abounding bass, while dominant, never overtakes the other soundtrack elements; the aural distinction between dialogue, SFX and music, all-encompassing and thoroughly effective. As with virtually all 4K releases thus far, extra content has been dropped, though mercifully, Paramount has included the standard 2-disc Blu-ray as compensation. Everything has been carried over from 2010’s Sapphire Edition, including an introduction from Spielberg, and brief featurettes: Looking In To The Past: The Research, the Screenplay and the Vision, Miller and his Platoon, Boot Camp for the Cast, Making Saving Private Ryan, Re-creating D-Day: Omaha Beach, Music And Sound and Parting Thoughts. The most comprehensive extra is Shooting War, at just under an hour and a half, a fairly engrossing testament to WWII combat photographers, narrated by Tom Hanks and written/produced by film historian, Richard Schickel albeit, in SD. 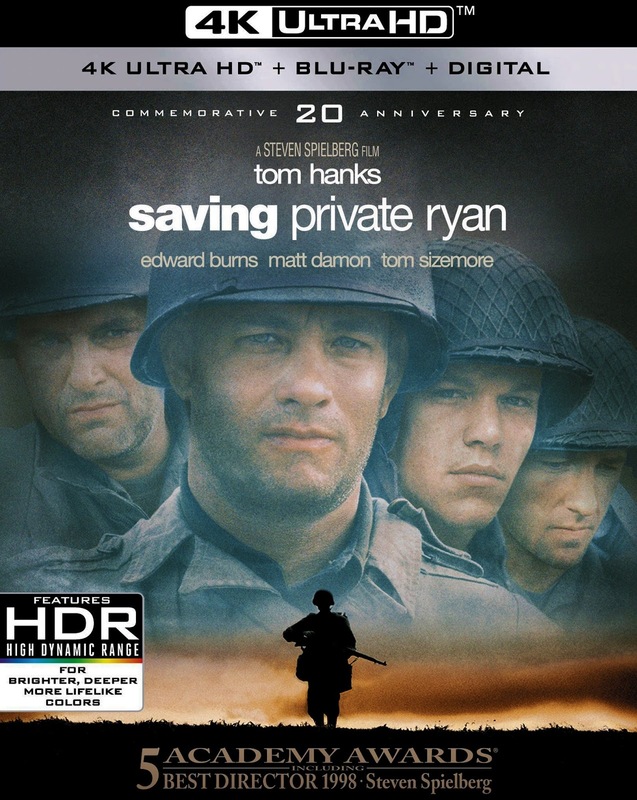 Bottom line: this is the definitive home video presentation for Saving Private Ryan. It comes very highly recommended!